Sony/BMG has released a new 20th Anniversary DVD version of THE Transformers: The Movie, which is out in stores now. We here received our copy a week late and have been so far slow to report, but look forward to a detailed review soon. Commentaries and interviews with the director, Nelson Shin, co-writer Flint Dille, and voice of Arcee, Susan Blu. Still no copy of the Stan Bush video "The Touch"
Still incomplete collection of movie and toy commercials. Some commercials (including the ones narrated by Victor Caroli) are on this website but are missing on the disc. 8/8/06: Back on the air - Happy 20th Anniversary, TFTM! Twenty years ago today The Transformers: The Movie was released in movie theaters throughout the United States. 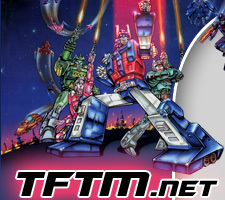 Now it is the year 2006, and to commemorate, TFTM.NET has returned to the Internet after another long hiatus. Look for unbiased reviews of the UK Metrodome and upcoming Sony/BMG DVD's, as well as many more updates in the near future! Please bear in mind this non-commercial site does not make money, so any Paypal donations that would help offset the bandwidth costs would be greatly appreciated.